The Los Angeles based law firm comments on a recent news article that drivers need to be constantly on the alert. LA area drivers need to aware that bicyclists can appear just about anywhere and at any time. A March 19th article from CBS Los Angeles reported on a study looking at ways that Los Angeles County bicyclists can be made safer, including possible physical barriers for bike lanes. Los Angeles based personal injury firm Legal Defenders at the Law Offices of Burg & Brock says the proposed bike barriers could potentially greatly reduce severe vehicle and cyclist collisions by separating the two lanes physically. The firm adds, however, that the importance of drivers staying alert to smaller vehicles and pedestrians at all times and wherever they are is not going to change any time soon. The legal firm notes that auto collisions with cyclists and pedestrians result in an alarming number of grievous injuries across the country each year, far too many of which prove fatal. The personal injury firm highlights driver caution and awareness as the best preventative measures for drivers, whatever other measures are being taken. Bike lanes in the LA area are currently designated only by painted street markings such as road lines, says Legal Defenders. In a heavily trafficked area like Los Angeles, that may not be remotely enough to protect cyclists, notes the legal team. Adding bike lane barriers will at the very least separate the driving lane from the bike lane, and that will prevent drivers from edging into bike lanes accidentally or on purpose. The main thing, says the firm, is for drivers to become more aware of the space around their vehicles. It’s not as simple as it may sound because cyclists are much less visible than the automobiles that they share the road with. Glancing in the rear-view mirror before merging or turning is simply not sufficient with such a large number of bicycle enthusiasts in the city, adds Legal Defenders. 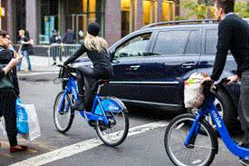 Drivers need to routinely check their surroundings even more than usual in dense urban areas that have large numbers of cyclists and pedestrians. Los Angeles has always had an intense car culture due to its sprawling nature, says the legal firm, but increasingly young people are more willing to walk or bike to work. Urban planners say that that will take a lot of stress off of the traffic grid but the increased risk of deaths or injuries is obvious. Not only will drivers harm others less in automobile accidents with greater awareness and thoughtful precautions like new bike barriers but upgrading the transportation infrastructure of such a large metropolis will have a positive effect on Los Angeles County overall. Readers who wish to learn more about Legal Defenders at the Law Office of Burg & Brock or would like to set up an appointment for free consultation are encouraged to visit the firm’s website at https://www.legaldefenders.com/ or call their office at 818-938-2528 & 888-252-1295.